At Soft Touch Dentistry, we consider it a privilege to care for your entire family. We offer top quality dental care services to patients of all ages. We pride ourselves on providing a warm, caring environment that is eco-friendly and equipped with the latest dental technology and equipment. From our mercury-free fillings and ultra low exposure digital x-rays to our relaxing music, blankets and sedation dentistry services, you can be sure your dental needs will be accomplished in a safe and stress-free atmosphere. Dr. Sarah Thompson is an experienced and highly skilled dentist who is passionate about helping patients gain a healthy, beautiful and long-lasting smile. 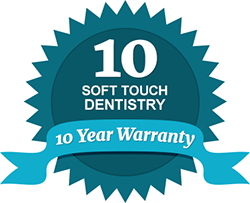 For a caring family dentist that you can trust with all aspects of your smile, choose Dr. Thompson of Soft Touch Dentistry. She carries over a decade of experience in private practice and is well known for her smile-changing results in cosmetic dentistry. We welcome the opportunity to care for your family. Our practice accepts most dental insurance carriers and we offer flexible financing plans for your convenience. Contact us today and ensure your family’s oral health is in good hands.